We thought this was a good label because it does an excellent job of answering the age-old question: “Why Brewed with Potatoes?” That’s what we wanted to know, and this label is happy to oblige. It helpfully explains that potatoes add sugars that supply dryness to this extra-dry stout. 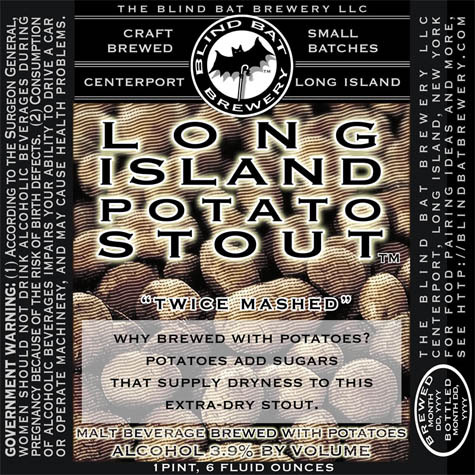 Long Island Potato Stout is made by The Blind Bat Brewery of Centerport, NY. It is classified as a Malt Beverage Brewed with Potatoes. TTB has also approved Finnegan’s Ale Brewed with Potatoes. It is made by Summit Brewing Company in Saint Paul, MN. Note that TTB has asked Summit to add “Product of USA,” probably because of the large reference to Irish Amber and several four-leaf clovers.